Although I haven't seen the movie, I just finished reading / listening to Unbroken: A World War II Story of Survival, Resilience, and Redemption by Laura Hillenbrand. (Side note: did you know you can switch between the two -- reading and listening -- and Kindle/Audible will sync with one another for some books?! This isn't sponsored, just a tip that blew me away and made finishing this book infinitely easier for me because I could listen while I hiked or drove because I haven't had much time to sit lately, so I thought I'd share.) The irony is I had treatment yesterday and have hardly left the couch today. Unbroken is an epic tale of one man's life, from boyhood rebellion to Olympic runner to airman in World War II. In the war, his plane went down in the Pacific and he was stranded at sea for more than forty-five days on a disintegrating life raft. When he was "rescued," it was by Japanese, who put him in a variety of POW camps where he survived the unthinkable for more than two years. On the back cover blurb of the book, it says: "Unbroken is an unforgettable testament to the resilience of the human mind, body, and spirit. . ."
My reading of such an incredible tale was timely, as I headed to a conference last weekend where I met dozens of people who are a further testament to the resilience of the human mind, body, and spirit (not to compare what we've been through to what our servicemen endured in WWII, but humanity in the face of hardship can be pretty incredible). 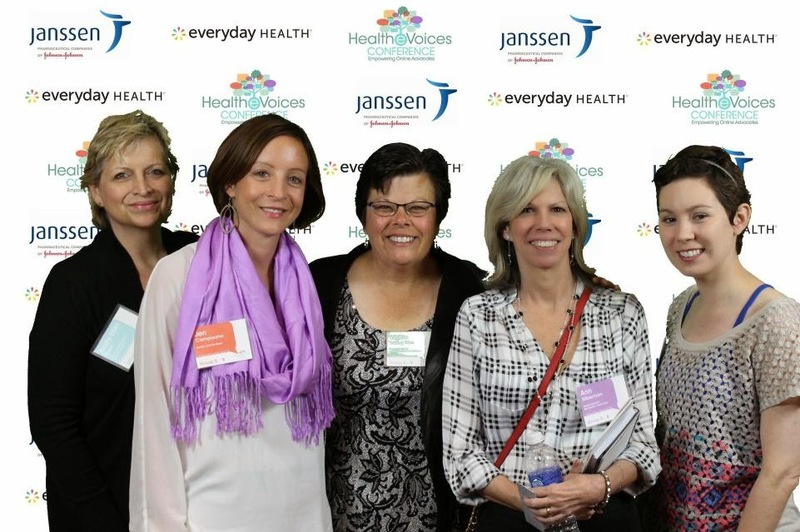 The HealtheVoices 2015 Conference brought together more than sixty health bloggers from around the country, representing various conditions for which we advocate (and for most of us, live with): cancer, HIV, diabetes, cardiovascular disease, mental illness, Crohn's/colitis, and rheumatoid arthritis. This conference was, as far as I can tell, the first of its kind. It brought dozens of voices together to explore how to collaborate across our varying ailments, think about how to raise the volume on our advocacy efforts, and -- most importantly, I think -- discover ways to more effectively serve the patients and caregivers who turn to us for support. The summit was sponsored by Janssen Biotech, Inc. in collaboration with Everyday Health, and I should point out that Janssen paid for my travel expenses for the summit. All thoughts and opinions expressed here are, of course, my own. There was a cocktail reception that evening followed by a dinner program in a windowed room overlooking the Hudson River and the New York skyline. It was an effort to focus on the speakers and not the view (seen here the next morning when I got up early to walk around a bit and soak it in). Saturday kicked off with an inspiring and entertaining keynote by Dr. Zubin Damania (aka ZDoggMD), who told us we were part of the next wave of medicine, Medicine 3.0, if you will, in which medical information would be open and available to patients, relationships between providers and patients would exist like they did in the past, but would be more of a partnership and less of a paternalistic relationship, and that we, as online advocates, would be part of making that transition happen. He spoke to us about leaving his career as a doctor at Stanford (by way of some hilarious and avant-garde videos) to help open a membership-based (like a gym!) primary care clinic in Las Vegas that goes beyond traditional medicine by offering a range of services, including yoga and counseling. Saturday was a whirlwind of breakout sessions on a range of topics aimed at making us better at what we do, including a session on legal issues in online advocacy that almost made me nostalgic for law school. There was a little time for catching up with other attendees between sessions and during meals, and then we broke into smaller groups for dinner Saturday night, where I had the privilege of sitting next to the inspiring Chrisa Hickey, who writes about living with a son who was diagnosed with schizophrenia when he was just eleven years young. She has taken this challenge and turned it into a loving and safe online community of parents facing similar circumstances. Like so many bloggers I met this weekend, she has been faced with the unthinkable, picked herself (and others) up from the doldrums, and put one foot in front of the other until life was bearable again. Resilience, indeed. After dinner, I spoke with a man who was diagnosed with Stage 4 prostate cancer more than nine years ago and told he would probably die soon. He did not. I met a marine who was about to be deployed to Afghanistan when he got the terrible news that he was HIV positive. I spoke with another young mom who is sometimes debilitated due to her rheumatoid arthritis. Not one of these people looked sick. I don't look sick, either. Here is a photo of those of us who were attending and write about breast cancer. 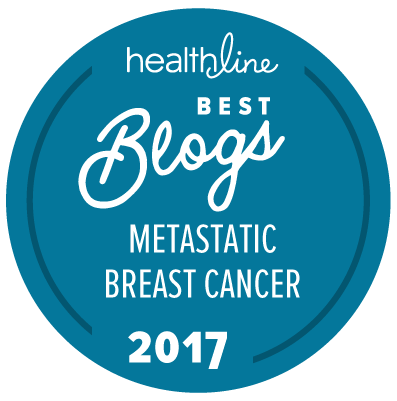 Four of the five of us have been told we have metastases. Three of the five of us are in remission. I don't think any of us appear ill. (From left to right: Kathy-Ellen Kups, RN, Life with Breast Cancer; me; Vickie Young Wen, I Want More Than a Pink Ribbon; Ann Silberman; and Heather Lagemann, Invasive Duct Tales. What I learned this weekend above and beyond how to be a better advocate, if I didn't know it already, was you never know what someone else might be going through. I looked around the room and realized that if we weren't all there together, I would never expect most of these people were facing any health hardships. You just never know. The old adage is so true: you can't judge a book by its cover. Also, never underestimate the resilience of the human spirit. You are right. We never know who is facing a big challenge. We walk around and most people seem "OK" but we really don't know what they are going through. It's a good thing to remember. There's a need for more empathy and understanding in this world, overall. Also, the more voices the better. I so agree -- the more voices, the better. I think more and more of these types of conferences are popping up as the industry realizes this new era of sharing information is here to stay. Hope to meet you at one soon! What a beautiful post, Jen. I'm so glad I got to share a town car and breakfast with you at the airport following Healthevoice15--we'd not have met, otherwise, even though we spent most of our time in the same big room! I think the biggest revelation I came away from the conference with is, like you say, that you can't just a book by its cover. No one there looked even a little bit ill, yet everyone there was in the midst of battling pain or other types of overwhelming sickness, whether physical or mental. And they were all smiling. They were all there to find out how to better help others like them. It was a "wow" weekend that I'm still mulling over, and one I'll never forget. Again, so glad I met and talked to you. I hope you're feeling well and that your family is, too. What a beautiful little boy you have! Great to connect with you too, Wren! Hope you're well!! My dear Jen, you have done it again--beautiful post that grounds and steadies me. You are my inspiration!!! That is something I think about often: how do I be a good advocate. Looks like a neat experience! I am glad you got to go! I think the simplest way to advocate is to use your voice. Look what happened with Holley Kitchen's video!